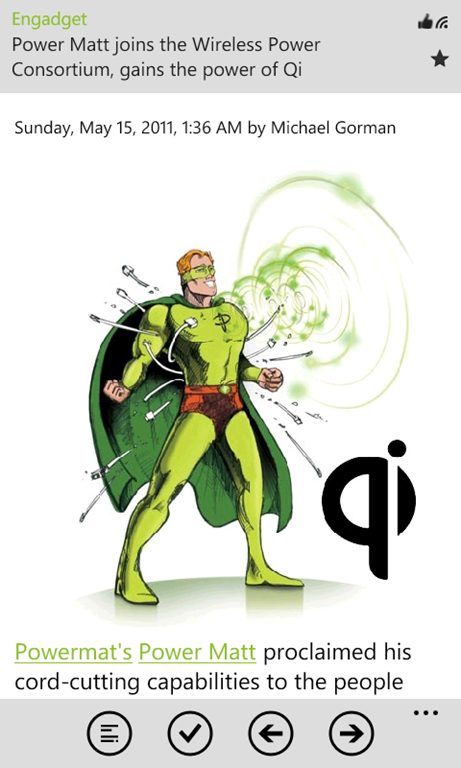 Today we’re excited to announce that NextGen Reader v1.14 is now available in marketplace. New Tile: Thanks to Matt Grey for his excellent contribution on new logo. 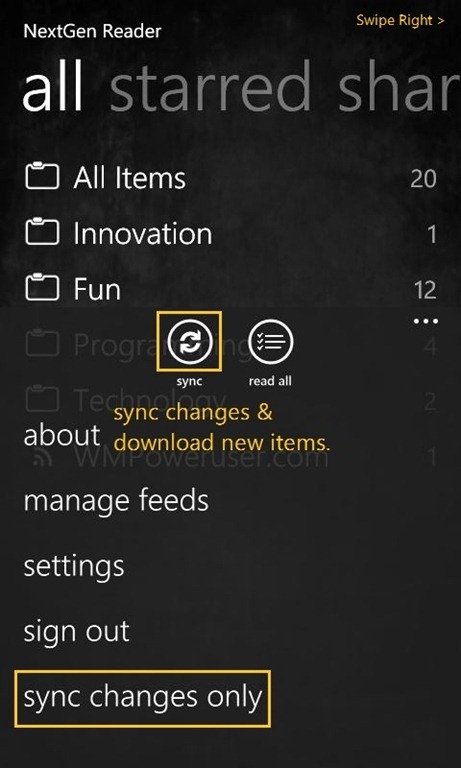 The new tile is designed keeping in mind the future enhancements for Mango as well as Live tile support. Performance improvements: As always, max. performance with minimum battery utilization has been top goal for ngreader. You’ll notice faster startup and sync times from version 1.12. 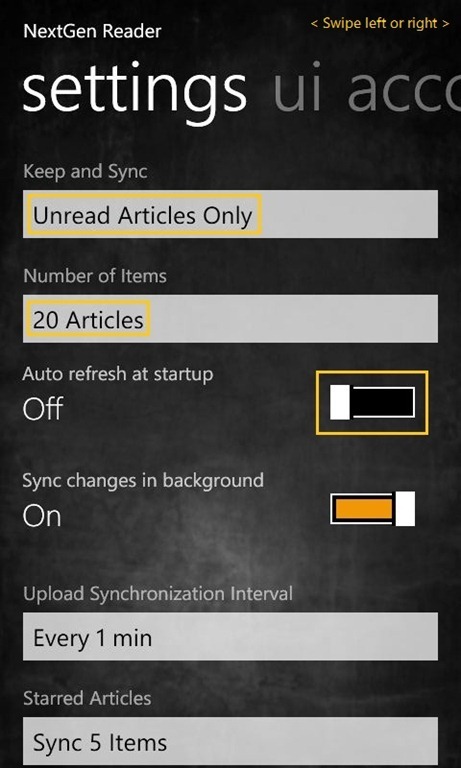 Background Sync: Starting with v1.12, the sync happens in background so that you can browse through existing feeds or even read articles if you sync large number of items. YouTube support: As many of you’ve asked for this feature, it’s finally available in ngreader. You can directly watch the video or open the link in browser to see related videos. I hope you enjoy this feature and do let me know if you come across any issues. Improved scrolling: In v1.14, you’ll find scrolling is more reactive for NoDo users and if you’re running Mango beta then it’s really smooth just like native apps. Improved article rendering: I’ve done few minor changes for better layout and reading experience. Also, a new update is coming soon for mango build 7712 with better resizing algorithm for images. Social networks: New share to windows live option in addition to twitter support. Also, Facebook support is coming in next release. Improved Sharing: You can share status to multiple networks with just one tap. URL or link shortener is enabled by default and some small improvements like you can customize the text easily before sharing. And also fixed few bug fixes! I hope you enjoy the update – do give it a try! The trial version is free of ads and no limitations with just one exception of sharing via twitter. As usual I’ve been busy working on the next version of application and if you’ve some cool ideas for Mango release, then please do share with us. Keep the feedback coming and also don’t forget to share your live ID for preview of next release. Hello friends, the new update (v1.11) is now available in marketplace, and if you’ve some extra time then do check out my thoughts on windows 8 and tablets in previous post. First of all I’m really thankful to the users who’ve send me tons of feedback including crash reports which have helped me tremendously in improving the application. I hope they enjoy the update and I will keep on adding more important features in future as well. 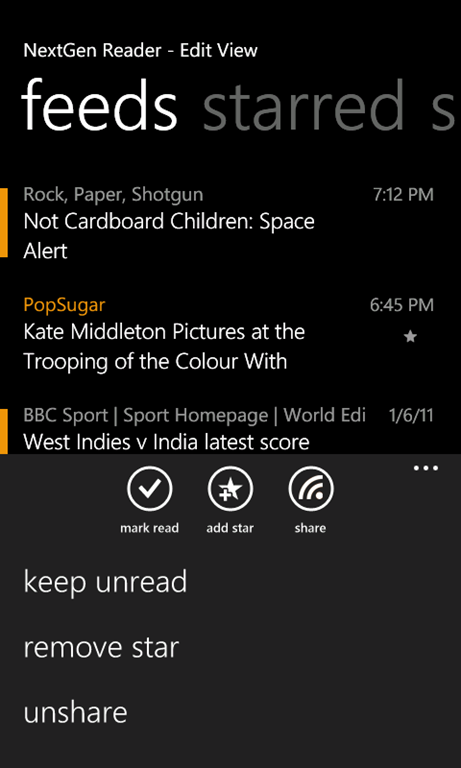 selecting and marking multiple items as read/star/share is even more fast and quicker. improved touch sensitivity while selecting an item i.e. tapping on left side. improved scrolling and tilt effect. full screen for reading article. set default mobilizer from settings->ui tab. google mobilizer with no images option. #) future updates will preserve the user settings. #) maintain aspect ratio while resizing images. #) fixed multiple crashes and bugs. As always, I’m continuously working on the application, so please feel free to send us feedback or features – you would like to see in NG Reader. Hello/Hola/Hallo to my English, Spanish and German friends and rest of the world. 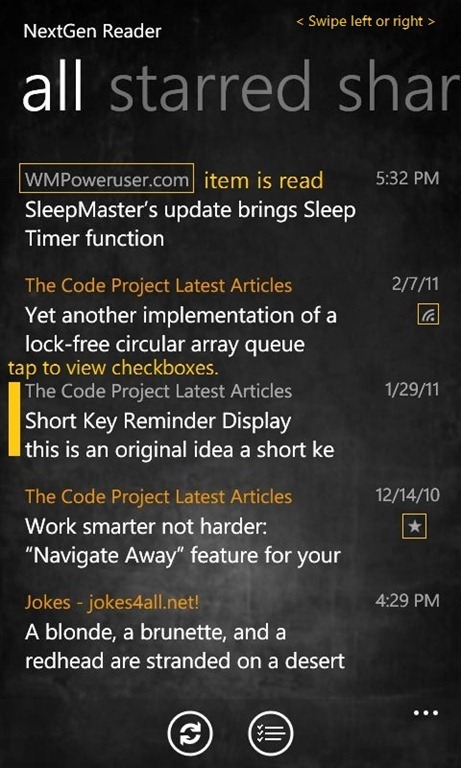 First a huge thanks to everyone for the continuous feedback and helping us make NextGen Reader one of the best apps on WP7 platform. Personally I’m very excited about NGReader v1.10 as it brings a good deal of new functionality since we launched the application back in January. I know… I’ve taken a bit longer than usual update cycle since v1.9 but for future updates I’ll try to come up with a shorter three weeks cycle i.e. two weeks of development + one week for testing. improved performance and battery life with up to 25% less memory utilization. increased feed quota to 1000 articles. 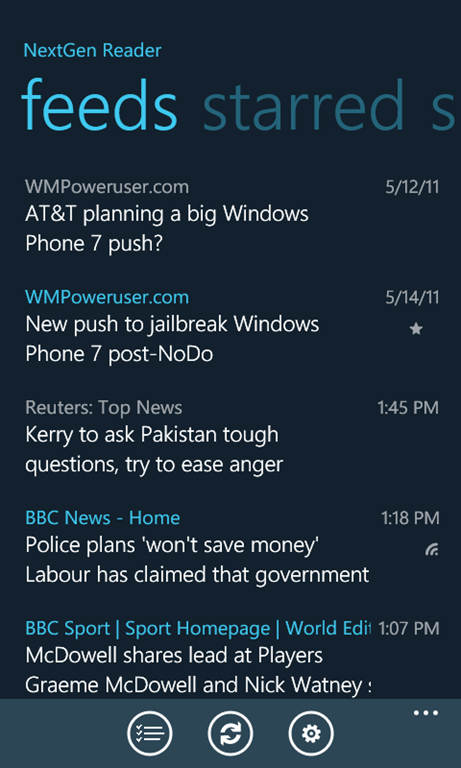 new application theme with teal color. new toast messages for various notifications e.g. 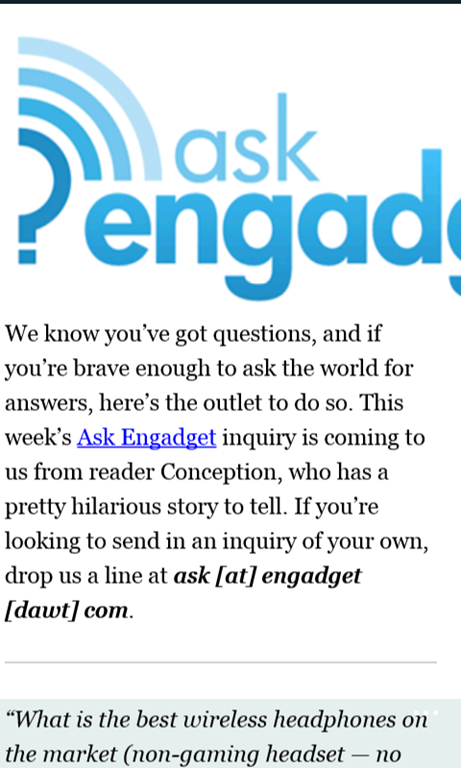 sent to instapaper, read it later. 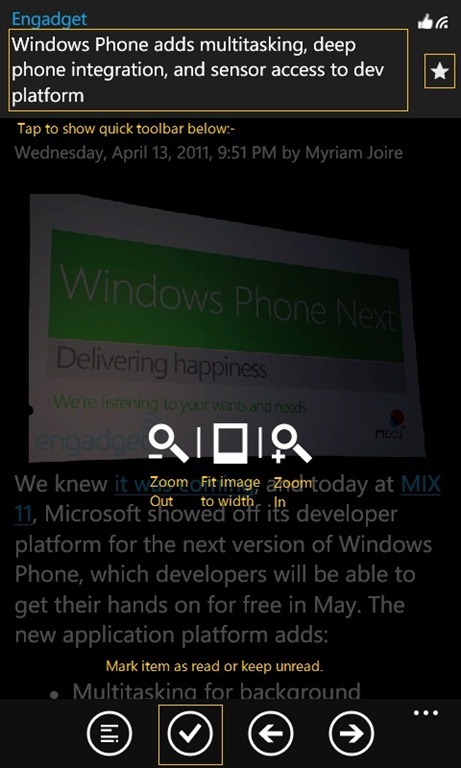 hold feed title to show quick toolbar in article view & single tap to resize images. fixed multiple crashes seen during refresh or using back button to return to application. many other changes and bug fixes. As always you’re welcomed to send us more feedback on ngreader(at)live.com or @ngreader on twitter. 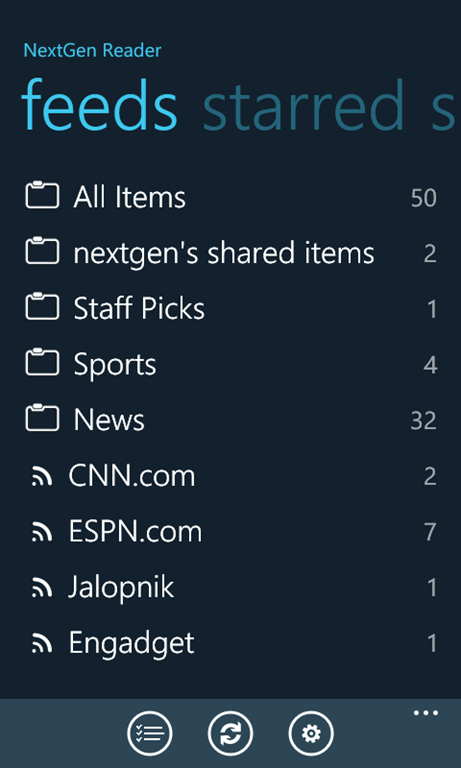 One last thing before I finish the post – “NextGen Reader is still a work in progress and long distance away from the experience I’ve in my mind for a perfect news reader client”. I hope … I’ll manage to solve this problem one day and create a wonderful seamless experience for everyone till then bye-bye…! Hello there, it’s been long since I posted about v1.6 release and been busy developing and fixing NextGen Reader. 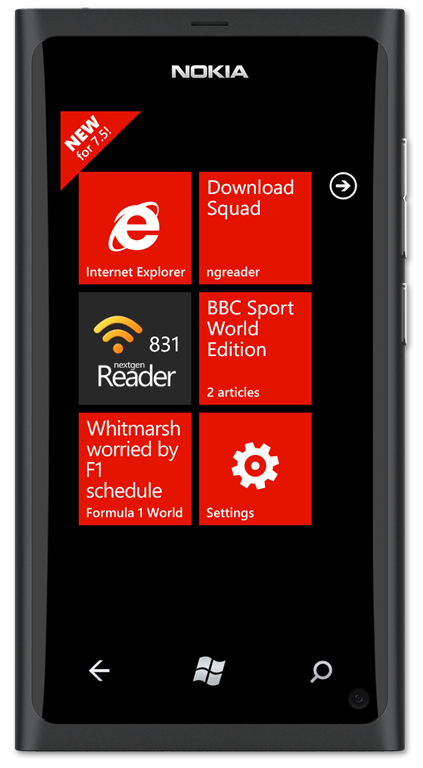 Thanks to everyone for the response and continuous feedback which helps and motivate me to make @ngreader best RSS Reader for WP7. Alright, so this week has been fantastic with details on Mango update revealed by Microsoft. I’m so excited and can’t wait for it to happen. 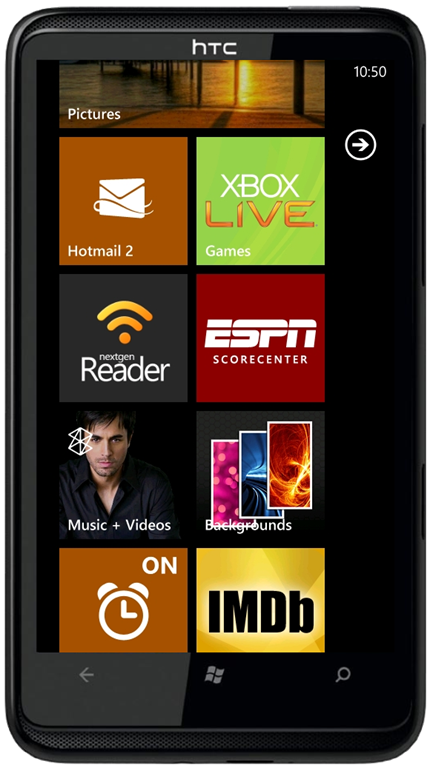 With 1500 new API’s added I think WP7 has a great future ahead. Coming back to my app, now I’ll make sure that I blog more often at least whenever NextGen Reader gets updated. My last post was on version 1.6, since then NextGen Reader has been updated twice and today we have released v1.9. Let’s talk about this update first and the new features coming in future. – improved article view with published time and author name details. – links within article now displayed in phone theme color. 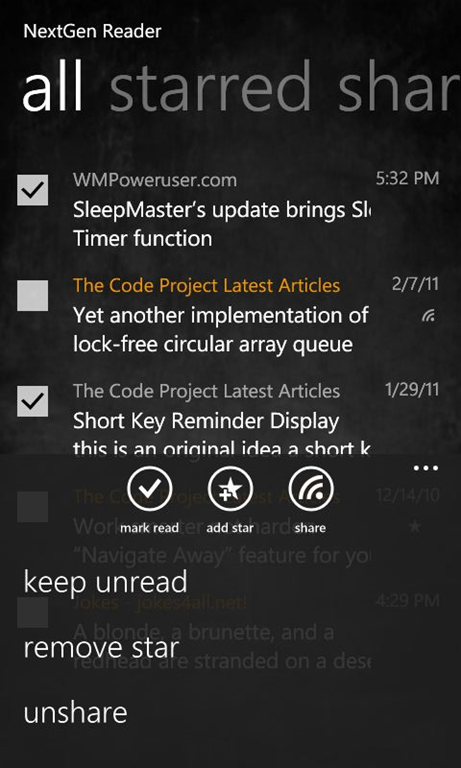 – “read all” button to display checkboxes with all items selected. 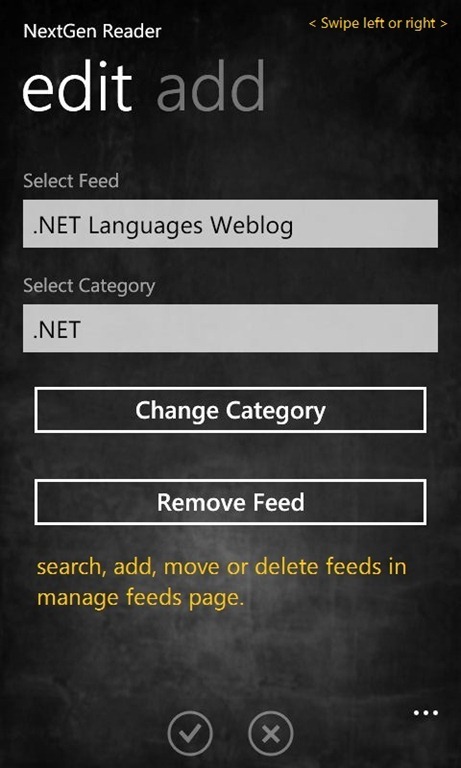 – new mobilized view with toggle switch. – fixed crashes and other bugs. 1. First of all, marking all as read requires only two taps as previously you would press “read all” appbar button and then select “yes” on message box confirmation. Now you have to press appbar button, it will select all items and display checkboxes. Tap again on first appbar button to mark them as read. 2. If you have marked all items as read by mistake then it’s easy to mark all as unread, since you can now easily select all items and then choose “keep unread” from the appbar menu. 3. Let’s say you’ve ten items in list and wanted to mark nine as read and keep one unread. First press appbar button to show all items selected with checkboxes, now tap on an item to de-select it and then simply press “mark read” appbar button to mark remaining items as read. Doing same thing earlier would have required twice the number of taps. Another important change is new full screen reading view with toggle switch at top to enable/disable InstaPaper mobilizer. 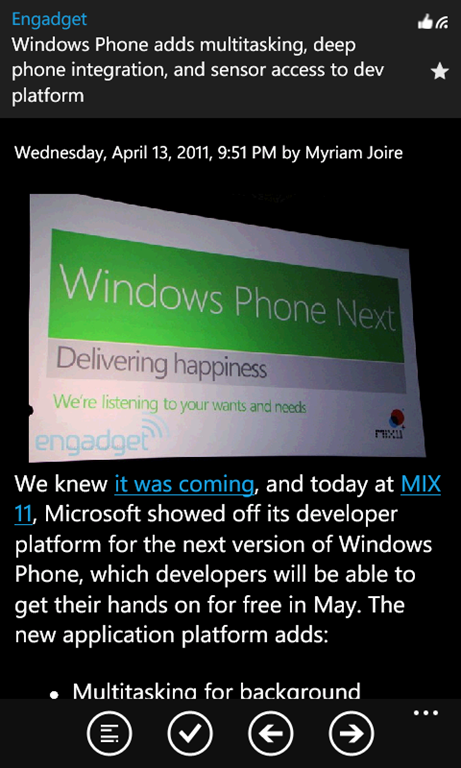 Also I’ve added smooth animations in article view when moving to next or previous article just like official wp7 email application. Again thanks to those who have sent lots of feedback over the last month and it has helped us tremendously in improving the application. 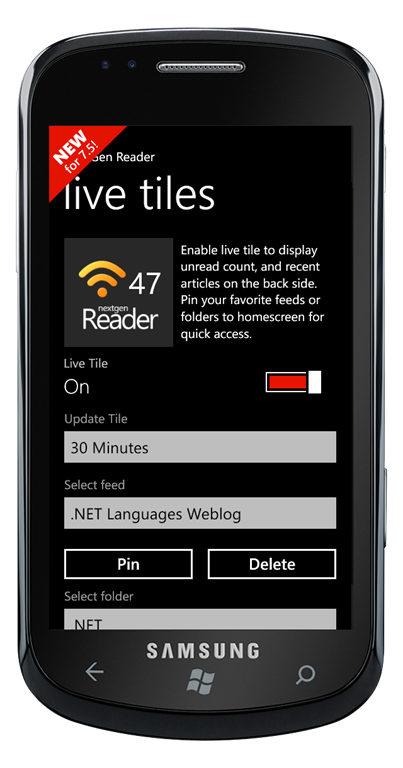 Finally some sneak peak into NextGen Reader future: most important features coming to NextGen Reader in future updates are Live tile support, Youtube videos handling and increased article/feed quota limit. Apart from these, I’ve many other features in plan and will talk about them in future posts. So please keep sending your feedback anyway you like – email, twitter or comments. NextGen Reader v1.6 is now ready to roll in marketplace, actually it could have been available more sooner if I hadn’t come across the weird problem where “publish to marketplace” button doesn’t works from the “windows phone: my apps” list page. However a Google search later confirmed the problem: http://forums.create.msdn.com/forums/t/73198.aspx , and the simple workaround is to go to the application page first and then select the action to publish. 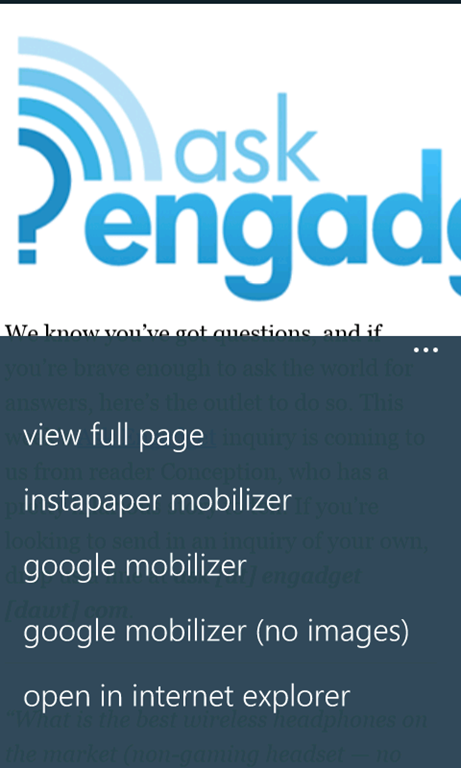 Mobilizer: added instapaper mobilizer for quickly reading the complete article without having to leave the application. New global setting to disable image width to fit coloumn. Added support for Read It Later, in addition to existing InstaPaper support in app. Improved download speeds while fetching articles. 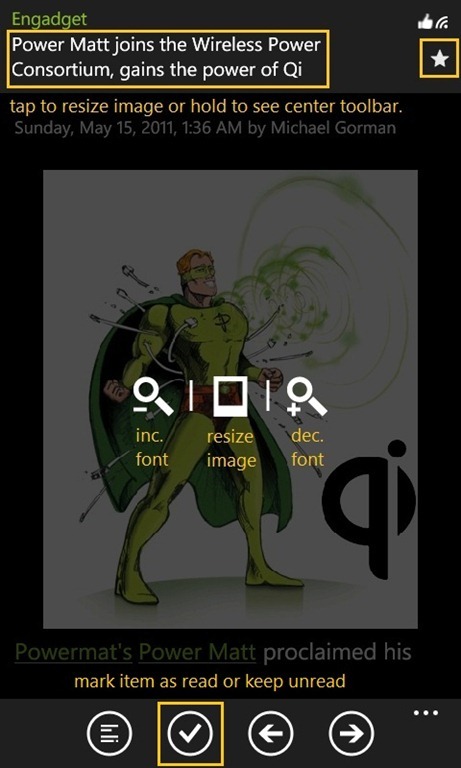 Toggle image width to fit column using quick toolbar is very useful if you happen to follow comic feeds, more important the setting remains effective in article view while you move to the next or previous item unless you go back to list view and select a new item, where it will restore your global preference. Below are few screenshots showing some important features of NextGen Reader, and a video of NGReader v1.5 at the end.